The sacroiliac joint, often referred to as the “SI joint” is the space located between the sacrum bone and the back of the hip bone. 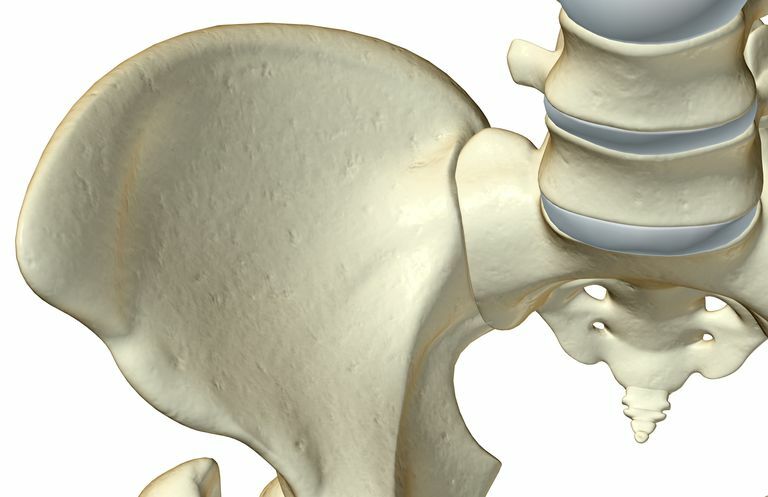 You might think of the SI joint as the place where the spine connects to the pelvis at and around the level of your hips. You have two SI joints—one on either side of the sacrum. Like most joints of the body, the sacroiliac is comprised of two bones, namely, the sacrum and the ilium. In front, it is classified as diarthrodial joint (which means it is a freely movable type of joint) comprised of the sacrum and the two hip bones in the back. These two hip bones (ilium, as mentioned above) are technically called the innominates of the pelvis. The back of the SI joint is not as moveable as the front. The sacrum is a triangularly shaped bone located just below the lumbar spine. The last lumbar vertebra (and the weight of the entire spinal column for that matter) sits on the top surface of the sacrum (which is an area known as the sacral base). On either side, the ilium provides a kind of buttressing support to the sacrum. The sacrum locks in between the two ilia (or innominates) by acting as a wedge. The top of the sacrum is wider than the bottom, which enables a snug fit between the bones at that level. The bones are further held in place by ligaments. Along with securing the fit of the joint, these ligaments help the sacrum support the weight of the spine and head. The interosseous sacroiliac ligament is located between the ilium and sacrum. It helps maintain joint congruency and is located where most of the weight transfer from the spine to the hip (and lower extremity) occurs. The posterior sacroiliac ligament is a continuation of interossus sacroiliac ligament. It provides support to the interlocking mechanism on the front surfaces of the bones of the joint by bringing the ilium closer to the sacrum; in this way, it helps the sacrum take the weight of the spine from above. The iliolumbar ligament assists the weight transfer and support functions of the interosseus sacroiliac and posterior sacroiliac ligaments as described above. The sacrotuberous ligament is a big ligament that goes from the sacrum to the sitting bones (ischial tuberosities). The sacrospinous ligament smaller ligament that also goes from the sacrum to the sitting bones, but does not span as much of the joint as the sacrotuberous ligament. Both the sacrotuberous and the sacrospinous ligaments limit flexion movement of the sacrum. Sacral flexion is also called nutation and is defined below. In front, the anterior ligament is really just a thickened extension of the capsule surrounding the SI joint. The anterior ligament is small, especially in comparison to the ligaments in the back. In the adult, the shape of the sacroiliac joint is oblong, but it is altered by an indentation that is concave in back and convex in front. More simply put, the joint is shaped much like an ear or a kidney bean. The SI joint is interesting because it is classified as one type of joint in front and another in back. In back, the SI joint is classified as a syndesmosis. This simply means the two bones (sacrum and ilium) are held together by ligaments. We talked about which ligaments those are above. The surface contours of each bone comprising the SI joint connect with one another; they interlock to form the front of the joint. SI joint integrity is maintained solely by this interlocking mechanism and the ligaments. As far as muscles go, portions of the gluteus maximus and the piriformis muscles cross the SI joint. The SI joint bears the weight of the spine. It is responsible for transmitting this weight into the area between the hip and foot inclusively, which is known as the lower extremity. It also transmits twisting (rotational) forces from the lower extremity that go all the way up into the spine. For example, during walking, just as you finish taking a step forward, your back leg is extended behind you and you are pushing off the big toe. (This is called the “push off” phase of gait.) At this point, there is minimal space between the two bones of the SI joint. This is called joint congruency or the “close pack” position of the joint. The close pack position of the SI joint helps transmit forces arising from the big toe as they transfer up the lower extremity, and pass through the sacrum and into the spine. The SI joint also transmits the weight of your spine onto the sitting bones (technically called the ischial tuberosities), during the act of sitting. As mentioned above, even though the front part of the SI joint is classified as a synovial joint, it has only a small degree of movement available to it. This is unusual for a synovial joint. One reason for the limited movement is the joint’s large weight support and transfer responsibility, which requires stability and a close connection between the sacrum and the ilium. Both hip bones tilt forward while the sacrum stays put, called anterior innominate tilt. One hip bone tilts forward, the other tilts backward and the sacrum stays put. This happens when you walk and is called antagonistic innominate tilt. The sacrum flexes, which is called nutation. The sacrum extends, called counternutation. Again the movements at the SI joint are small; also, when the sacrum moves, the hip bones may also move along with it. Moore, K., Dalley, A. Clinically Oriented Anatomy. Fifth. Edition. Lippincott, Williams & Wilkins. 2006. Baltimore. Pool-Goudzwaard A, Hoek van Dijke G, Mulder P, Spoor C, Snijders C, Stoeckart R.. The iliolumbar ligament: its influence on stability of the sacroiliac joint. Clin Biomech Feb. 2003 Feb.